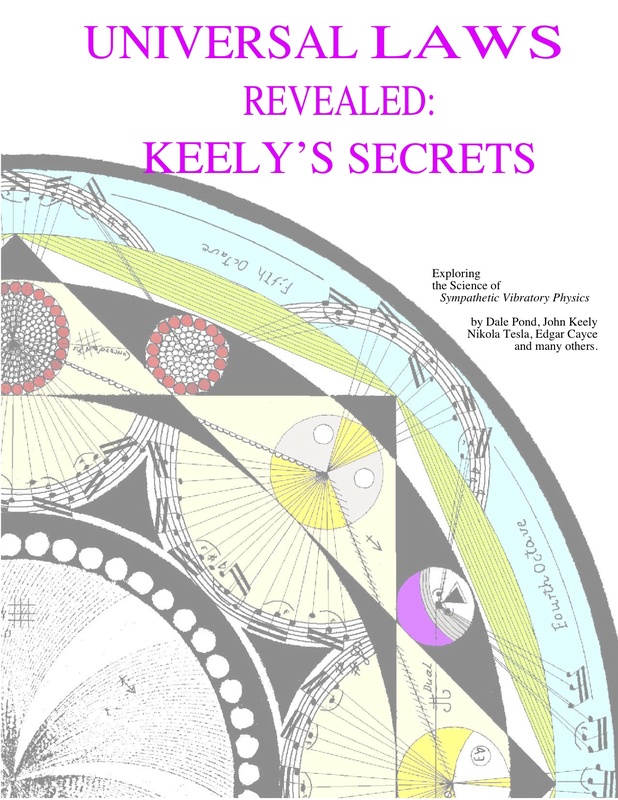 New and improved special edition of "Universal Laws Never Before Revealed: Keely's Secrets". We have it on Higher Authority this book will make a huge impact on science and be the foundation text for the coming New Science. Ten years of research went into this book. This collection of articles by Keely, Tesla, Dale Pond and many others reveals the scientific significance and correlations of Keely's work: the science of Sympathetic Vibratory Physics. The text has been completely retypeset, laid-out and re-illustrated. This volume contains the most comprehensive interpretation of SVP ever done. This is the definitive book on Keely's discoveries and science. It includes Pond's clarifications on Keely's 40 Laws of Harmony. Extensively illustrated including the original crystal clear Library of Congress photographs. Most of KeelyÃ•s beautiful Acoustic Charts (donated by Mr. Tonn) have been computer enhanced and are legible and are included. Contains a comprehensive bibliography of source materials. 8.5" x 11", 285 pages. "This is future technology beyond anything we have discussed in FTIR. We have known of John W. Keely (and Dale Pond) since 1990, and brought KeelyÃ•s work to your attention on a couple of occasions. Now comes this beautifully produced volume, over-size, with photographs, patent drawings, charts, graphs, etc. May be, at long last, Keely's genius and Dale Pond's persistence will penetrate a substantial market. Keely is truly unique, a technology unlike anything else we know about, magnificent intricacy. In brief, all is sympathetic vibration, and sympathetic vibration is the etheric force. But this essential simplicity may be why Keely's work has taken so long to penetrate. The casual reader opening a Keely book is faced with equipment that superficially resembles late 19th century workbench apparatus but described in musical, acoustical terms. Dale Pond has done a masterful job at laying out KeelyÃ•s ideas and blending text with diagrams and photographs, but many of the concepts are elusive (As an example, Keely's triple chords still baffle this Editor.) Working in 1880, Keely is 200 years ahead of the rest of us. For example, on page 165 is a Keely schematic dated 1894 compared to a similar schematic by famed quantum physicist Richard Feynman over 80 years later. It takes an understanding of acoustics and musical theory to even begin to understand Keely. The essence is the "music of the spheres" known to ancient wisdom ... more simply all is sympathetic vibratory resonance. While modern engineering recognizes harmonics, Keely proposes many more relationships than merely doubling and halving frequencies. But this should not stiop you from spending time with KeelyÃ•s ideas. With just an introductory physics course somewhere in your background and acquaintance with musical theory (much of Keely is in musical notations) you will travel a long way with this book. This is the kind of book you pull out time and time again over the years each time mastering a little more of Keely's intricate, unique concepts. "I continue to find your work extremely interesting and exciting. I purchased your book "Universal Laws Never Before Revealed..." and thoroughly enjoyed it. I had trouble sleeping thinking about the many concepts covered therein... I also wrote a laudatory book review on the Amazon.com site, so hopefully more people can become aware of Keely and the study of sympathetic vibratory physics." IB Order your copy as soon as possible.